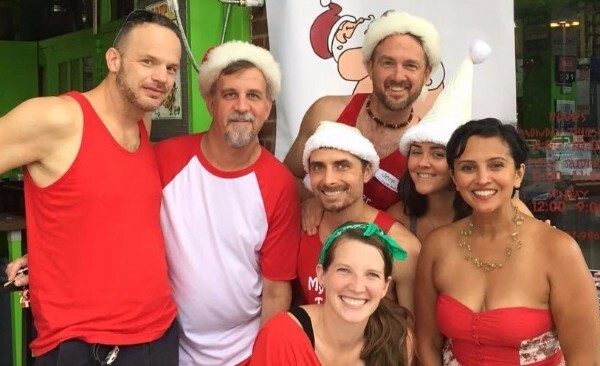 Saturday, December 10th is the date for the highly entertaining and sometimes revealing Atlanta Santa Speedo Run. Now in its eighth year, the 2016 run will help raise money to support CHRIS 180’s mission of helping Atlanta’s most vulnerable kids change the direction of their lives. The 2:00 pm fun run will take an estimated 300 participants for a 1.5 mile scramble through the Virginia-Highland neighborhood. Starting and ending at the famed Manuel’s Tavern, the course winds its way up North Highland Avenue to the heart of our popular neighborhood, passing such popular eateries and watering holes as Hand In Hand, Atkins Park, Murphy’s, Yeah Burger and Diesel, among others. 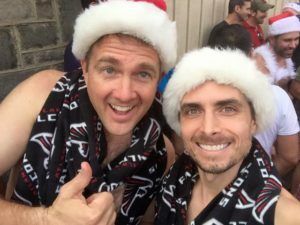 Since its inception in 2009, the Atlanta Santa Speedo Run has raised more than $500,000 for local Atlanta children’s charities. Past charitable organizations that have benefited from the run have included Bert’s Big Adventure, Camp Twin Lakes and Blaze Sports. The Santa Speedo Run was originally started in Boston in 2000 by five friends in search of a little holiday fun. 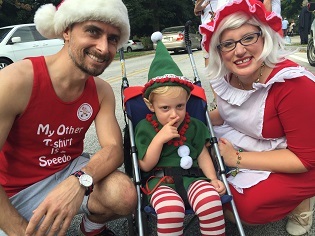 For the 2016 race, the Atlanta Santa Speedo Run is working with CHRIS 180 (formerly known as CHRIS Kids), with the goal to raise more than $100,000 for the organization. CHRIS 180’s mission is to heal children, strengthen families and build community through mental health counseling, training, providing safe housing and services that help youth build real-world skills. Donations help fight youth and teen homelessness and provide at-risk kids with the building blocks, skills and confidence to succeed in school and in life. A Speedo or similar holiday-themed attire is of course required and runners are encouraged to accessorize with holiday themed flair. Costume creativity promises to be at an all-time high this year so please come out and show some support for these two organizations and a wonderful Virginia-Highland tradition. For more information about the Atlanta Santa Speedo Run, including how to become a participant or a sponsor, visit AtlantaSantaSpeedoRun.org. Wear a little, give a lot. Click here to see an album of photos from previous runs.